Richmond Shores is a great place to be year round! Come have some summer fun, enjoy the autumn colors or play in the snow. 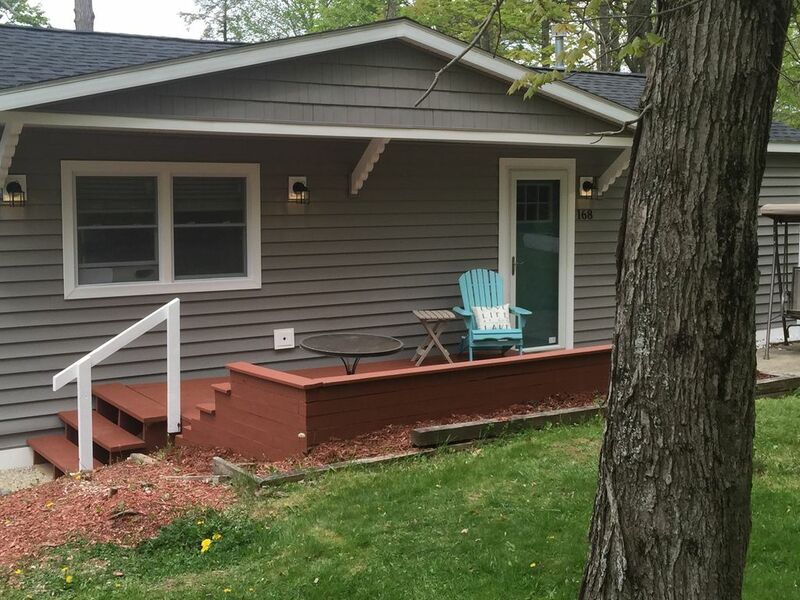 This year round cottage is the perfect spot for those who enjoy outdoor activities. The house is on a dead end road, has a lake view and very private yard that is surrounded by woods. The house is truly very child & family friendly. Your kids will love our house! Our property has a large yard with a swing set and fire pit for S'mores! There is a closet full of board games for the family to enjoy in the evening or on rainy days! We have 2 kayaks as well as 3 adult bikes and a children's bike. There is a private beach for the cottages in Richmond Shores. This private association beach is less than a minute walk from our house, has a roped off area for young children and a raft to swim out to for older children. The private association beach also has built a sand pit for the kids to enjoy and provide adirondack style chairs for the adults to sit and relax. The town of Richmond also has a public beach further down the road that has a lifeguard on duty. The house is 10 minutes from Tanglewood for summer concerts and a few short miles to Bosquet Ski area for skiing in the winter. Great location if you want to be near Lenox, Stockbridge, or Pittsfield; for easy access to all the pleasures that the Berkshires have to offer. In the winter, Bosquet Ski area is a great affordable mountain that is five minutes away. Great rates including $10 on Thursday nights. Jiminy Peak and Butternut are both an easy drive. The house has 3 bedrooms, 1 full bath and is fully furnished. The 1st and 2nd bedroom have queen sized beds, the 3rd bedroom has a day bed along with a twin size trundle bed. All towels, sheets and blankets are provided. If you have any special needs prior to arrival, we will do our best to accommodate your requests. Our goal is to make sure that your vacation is relaxing and we will do our best to ease the stress of vacation. Craig and I have been married over 15 years and have two children. When we first got married, Craig's job required us to move 9 times in 12 years domestically and internationally. We purchased this vacation home while we were living overseas so our family would have a place to call home. We moved back to the Boston area for Craig to attend MIT Sloan to get his MBA. During this time, I began working for an agency that managed vacation rentals and Bed & Breakfasts in the Boston area. From this experience, I truly learned to love the hospitality aspect of the job and we began renting our cottage to guests traveling to the Berkshires. We now live permanently in the Boston area and we are very happy to continue to share our favorite place with others. In 2001, we were searching for a vacation home in the Berkshires and Southern Vermont. We have family in this area and wanted a place to call home while we lived abroad. As soon as we pulled into the driveway, we knew we were going to buy this house. It was the ultimate summer location to have our kids spend their summers. There are also several ski areas nearby which was also important to us. This house had a unique yard and location. It is lake view, seconds away from a private association beach, we have access to a dock to park our boat, private yard and lots of dirt roads along the lake to bike and walk. It reminded me of being a kid and enjoying the simple pleasures of summer which is exactly what we wanted our children to experience. I love the fact that I feel as if I am on a camping trip but with all the comfort of home (including dishwasher, washer & dryer). One of our favorite things to do is make a camp fire at night and make smores. We enjoy walking around the lake, taking the kids for bike rides and going out on the boat. We love walking up to Bartlett's Apple Orchard to get cider donuts for breakfast and various other baked goodies during the day! In the winter we love walking on the ice, sledding and playing in the snow. We have a closet full of board games which is great for when there is rain or snow. We always enjoy spending time as a family and it's a great getaway for Craig and I! Overall the accommodations were descent. The beds were comfortable and linens were clean. The house was reasonably clean. The bathroom door would not close. Kitchen hood exhaust did not work. Vent in living room ceiling was filthy. The refrigerator drawers were pretty dirty. For our purpose, which was a small home near skiing place it was adequate. My family and my brother's family stayed at the cottage for the weekend. There were four adults, two babies and two dogs. The house accommodated this size group well for the weekend. It was cozy and comfortable. We used the grill, stovetop and oven to cook. They all worked well. The community beach was very small. We preferred the town beach which was larger and had a more well kept swimming area. The water was warm even in September. We walked from the house to the town beach. We also walked to the Bartlett Orchard farmstore. We would recommend this cottage for a low key and relaxing weekend. We had 5 friends at Craig's house for a concert at Tanglewood. Great location for exploring everything. Really enjoyed our time here! Awesome yard for hanging out and fires. Clean place, well maintained. Bedrooms are a little small, but didn't matter to us since we all hung out in the kitchen, living room and yard. We'll definitely be back! The home was very quaint and quiet! We enjoyed our stay! The owner was very responsive to our questions, Thank you for a nice stay! Everything you need for a great stay. Well equipped house. Great to have access to bikes and kayaks. Train noise took some getting used to.